Pierre Gustave Toutant Beauregard was an American military leader. As a general in the Confederate Army during the American Civil War, Beauregard served in the Eastern and Western theaters and was the victorious field commander at the First Battle of Bull Run near Manassas, Virginia on July 21, 1861. Pierre Gustave-Toutant Beauregard was born on May, 28, 1818, at the Contreras sugar-cane plantation in St. Bernard Parish, Louisiana, about 20 miles (32 km) outside of New Orleans. He was the third child of Jacques Toutant-Beauregard and Hélène Judith de Reggio Toutant-Beauregard, who were of French-Spanish Creole descent. Beauregard received his early education at private schools in New Orleans and in New York City, New York. In 1834, he gained admittance to the United States Military Academy and Americanized his name by removing the hyphen. Beauregard graduated from the academy, second in his class, in 1838 and was commissioned as a second lieutenant in the U.S. Army Corps of Engineers. Beauregard served in the United States Army from 1838-1861. He was wounded twice during the Mexican-American War (1846-1848). Beauregard was promoted to the rank of captain in 1853. Beauregard was superintendent of the United States Military Academy for five days, from January 23-28, 1861. After Louisiana seceded from the Union (January 26, 1861), he forsook the position. Beauregard resigned his commission from the United States Army on February 20, 1861. Beauregard was commissioned as the first brigadier general in the Confederate Army on March 1, 1861. He became an instant celebrity in the South when troops under his command fired on Fort Sumter on April 12, 1861, igniting the American Civil War. After subduing the garrison at Fort Sumter, Beauregard was placed in charge of the Alexandria Line of defenses near Manassas, Virginia, a position that he held from June 2-20, 1861. His principal task was to prepare for a possible invasion of Virginia by Brigadier General Irvin McDowell's Union army stationed at Washington, D.C. From June 20-July 20, Beauregard commanded the Confederate Army of the Potomac stationed near Manassas. From July 21-October 22, he served as a corps commander of the Army of the Potomac, yielding command of the entire army to his senior officer, Joseph E. Johnston. During the First Battle of Bull Run (July 21, 1861), Johnston utilized Beauregard's plans and allowed Beauregard to function as tactical commander in the field. 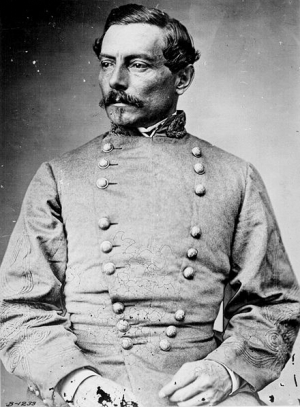 After the Confederate victory at Bull Run, Beauregard was promoted to the rank of full general, effective July 21. However, he also damaged his military career after the battle by publicly criticizing the Confederate administration in Richmond. His suggestion in the press that President Davis's interference with his battle plans prevented the destruction of McDowell's army and the capture of Washington initiated a feud between the two men that lasted the remainder of their lives. In 1862, Davis used Ulysses S. Grant's invasion of western Tennessee as an opportunity to remove Beauregard from the public spotlight in the East. Davis sent Beauregard west to help General Albert S. Johnston halt Grant's advance. Beauregard arrived in Bowling Green, in poor health, on February 4, 1862, and met Johnston for the first time. On February 12, Johnston charged Beauregard with the defense of the Mississippi Valley and placed him in command of Leonidas Polk's garrison at Columbus, Kentucky. Believing Polk's position was untenable, Beauregard ordered Polk to abandon the "Gibraltar of the West" and move his troops farther south. On March 3, 1862, Union troops occupied Columbus. Soon thereafter, Brigadier-General John Pope began operations against New Madrid, Missouri and Island No. 10, on the Mississippi River. Pope's successes between February 28 and April 8, 1862, left the Union solidly in control of Kentucky and western Tennessee. As Grant was amassing a large Union force at Pittsburg Landing on the Tennessee River, Johnston and Beauregard began reorganizing the troops in the Western Military Department to form the Confederate Army of the Mississippi. After organizing the army, Johnston and Beauregard set about developing a plan to regain Tennessee by striking Major General Ulysses S. Grant's Army of the Tennessee and then turning on Major General Don Carlos Buell's Army of the Ohio before the two forces could unite. Beauregard convinced Johnston to launch a surprise attack on the Federals. By April 5, Beauregard changed his mind, however, suspecting that the plan had been revealed. Despite Beauregard's doubts, Johnston remained resolute and launched the assault. The first day of the Battle of Shiloh (April 6-7) was a resounding Rebel victory. Caught off guard, the Federals were driven back and nearly pinned against the Tennessee River. During the afternoon, Johnston was mortally wounded, and Beauregard assumed command of the Army of the Mississippi. As darkness fell, Beauregard made the fateful decision to call off the Confederate assault for the day. That evening he sent a telegram to President Davis announcing "A COMPLETE VICTORY." During the night, Grant reorganized his army and was reinforced by the arrival of over 20,000 soldiers belonging to the Army of the Ohio. On April 7, Grant launched a surprise counterattack, forcing Beauregard to retreat to fortified positions located across the Tennessee border at Corinth, Mississippi. After the Battle of Shiloh, Henry Halleck took command of Grant's forces, moved against the important rail center at Corinth, and settled into a siege of the city in late May. Inside the city, Beauregard's soldiers were wracked by typhoid and dysentery caused by bad water. Facing the prospect of being enveloped by Halleck's massive force of nearly 125,000 soldiers, Beauregard saved his army with a brilliantly executed evacuation on May 29, 1862. Despite the circumstances that necessitated the withdrawal, Jefferson Davis was critical of Beauregard's decision. Beauregard reached Tupelo, Mississippi and established new headquarters on June 7, 1862. The Army of the Mississippi arrived on June 9. Five days later, Beauregard received a certificate of disability for a recurring throat problem. On June 15, Beauregard informed General Samuel Cooper, adjutant and inspector general at the war department, that he was transferring "the command of the forces and of this department to the next officer in rank, General B. Bragg." Beauregard then traveled to Alabama to recuperate while Bragg reorganized the army. When President Davis learned that Beauregard had left the army on an unauthorized sick leave, he relieved Beauregard of his command of the Army of the Mississippi and replaced him with Bragg. On August 29, 1862 Confederate officials ordered Beauregard to Charleston, South Carolina to command the Department of South Carolina and Georgia. For the next two years, he coordinated the defense of the Carolina and Georgia coast. In May 1864, Beauregard was sent north to help check Ulysses S. Grant's Overland Campaign. He commanded a Confederate force of 18,000 men that defeated Major General Benjamin Butler's army of 30,000 soldiers at the Battle of Proctor's Creek (May 12-14, 1864), ending Butler's offensive against Richmond, Virginia. Commanding a small Confederate force of about 2,200 soldiers, Beauregard held off repeated assaults by 16,000 Federals from June 15 through 17, at the Second Battle of Petersburg, until Robert E. Lee's army arrived to defend the city. On October 7, 1864, President Davis appointed Beauregard to command the Military Division of the West. Greatly outnumbered, Beauregard was unable to stop William T. Sherman's March to the Sea. In 1865, Beauregard was relegated to second-in-command of the defense of the Carolinas upon General Joseph Johnston's return to active duty. When Johnston surrendered his army to Sherman on April 26, 1865, the war effectively ended, and Beauregard returned to civilian life. Beauregard returned to New Orleans and took the oath of allegiance to the United States. On July 4, 1868, President Andrew Johnson extended amnesty to a group of Confederate leaders, including Beauregard. His citizenship was completely restored by an act of Congress, which was signed by President Grant on July 24, 1876. Following the war, Beauregard declined offers of high rank in the armies of Romania and Egypt. As a civilian he served as president of the New Orleans, Jackson, and Mississippi Railroad (1865-1870) and of the New Orleans and Carrollton Street Railway (1866-1876). Beauregard participated in the formation of the Reform Party in Louisiana, a coalition of moderate Democrats who supported civil rights for African Americans. Between 1877 and 1893, Beauregard served as commissioner of the Louisiana Lottery. In 1879, he was appointed as Adjutant General for the State of Louisiana, serving in this position until 1888. That year, Beauregard was elected as the commissioner of public works for the city of New Orleans. P.G.T. Beauregard died at New Orleans, Louisiana on February 20, 1893. He is buried in Metairie Cemetery, at New Orleans, Louisiana.